Following our Apple iPhone 6 poll, it’s now time for its bigger brother, the iPhone 6 Plus, to go under the spotlight. This is the first time Apple is making a 5.5″ smartphone, but the Android competition is more than ready in the face of the Samsung Galaxy Note 4, Galaxy Note Edge and the LG G3. 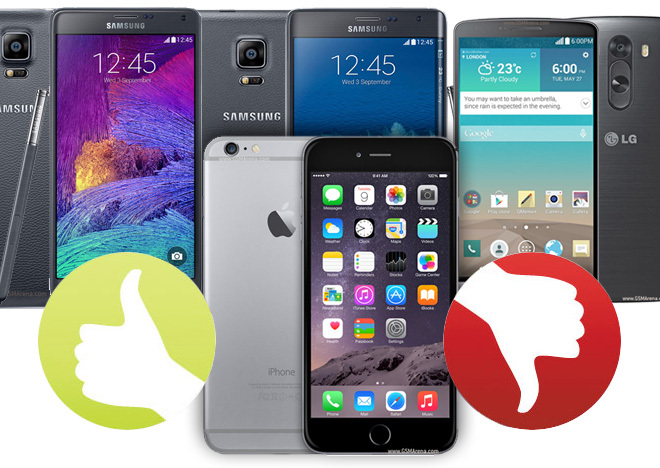 What’s left is to pit each one of them against the largest iPhone to date and see which you think is the better one in each of the polls. First up is the major battle the iPhone 6 Plus will be leading, against the Galaxy Note 4. Samsung’s fourth generation phablet is packed with awesome features like a QHD Super AMOLED display, 16MP ISOCELL camera with OIS and an updated S-Pen, just to name a few. The phablet faces Apple’s first try at this market segment and its first ever camera to feature OIS. We’re yet to see if Apple’s first swing at the ball is going to score it a home run, but until then, you can shout out your expectations in the vote below. The Samsung Galaxy Note Edge is very much an experiment phablet, just like the original Galaxy Note was. Its curved Super AMOLED display could prove like the next best thing in the world of smartphones, but it’s not without its flaws. If you had to chose between the Note Edge and the iPhone 6 Plus, which one would you take home? In all seriousness, both phones make up for an interesting duel. The iPhone 6 Plus is just as elegant as the LG G3 is feature-rich. One is made of metal and is great looking, while the other records 4K video and outputs it on its QHD display. Results will be in at the end of next week, so stay tuned and happy voting!